Happy Holidays everyone! Sorry it's been a while since I updated this blog, we've been out of town for Thanksgiving and generally busy and with the holidays and all I've been a slacker... 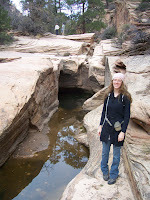 But anyhew, here are some pics from our trip to St. George for Thanksgiving with Michael's parents. We stayed in a hotel room with Michael's parents complete with a tiny kitchenette so I could make us green smoothies, and we really had fun. We went hot-tubbing, shopping (and shopping with parents who buy you things is always fun), and hung out with Michael's younger brother Scotty and his family. We continued the tradition of going to a buffet for Thanksgiving (which is fun and interesting, I had a huge salad with my own dressing and Michael ate his heart out with crab and all sorts of goodies). Michael's grandparents were there too, which was really awesome as they spend their winters in Nevada to stay a bit warmer so we don't get to see them as often during the holidays. Plus, since Michael is a little replica of his grandpa, it's fun hanging out with them and seeing where we will be in 50 years. We had an awesome time with Scotty our last night when we went with him and his fam to a little restaurant in St. George that had live music (kinda, some of it wasn't so good...) and some great food. We didn't get pictures of them or of the crab buffet for thanksgiving dinner, but we remembered our camera for our stop in Zions National Park on our way home. 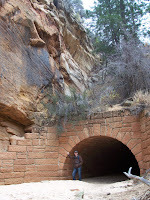 There was a cool tunnel in the river bed that was especially picturesque with the hotness Michael standing next to it. 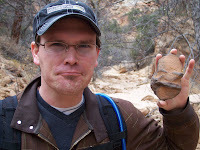 This was Michael and his rock buddy making faces for the camera. 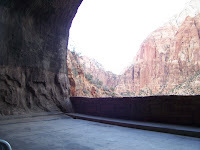 We drove through the tunnel in Zions to get to the eastern side of the park where the trail was, and the big windows they cut in the wall were so amazing. There was an awesome view, but no stopping is allowed in the tunnel so you have to grab a pic while passing by. 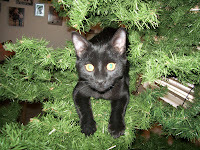 And now to Christmas, we finally put up the tree the first weekend of December or so and before I even had it all straightened out our kitten Teach had to jump on the thing and go crazy. Here's a video of him at the top going nuts. So, apparently the only ornament on our tree this year will be a little black cat... I was able to put up some lights but he still climbs it sometimes and tries to chew on the lights, who knew you could have claw marks on light bulbs? Hopefully he doesn't chew through the cord :) At least it's fun having someone in the house who has THAT much enthusiasm for Christmas. Happy Holidays, we'll be posting more about them soon!